A baptism is an important milestone in a Christian’s life. Some denominations allow infant and adult baptisms, some don’t, but the odds are that any Christians entering their new lives as parents will have to start planning out their child’s spiritual path as well as their physical path. To baptise essentially means to emerse. Some denominations have their followers enter a river to symbolically wash and purify their spirit. However, today, a baptism usually consists of a vicar trickling a little holy water over the child’s head as part of a larger ceremony. The best church for your child to be baptized in is, naturally, the parish you belong to. If parents do not belong to a particular parish, finding a church for a baptism is much like finding a church for a wedding. Look up all the churches in your vicinity, and schedule the ceremony in the most agreeable one. It is standard procedure for the parents to go through some sort of preparation with church officiants, in order to get better acquaintanced with the ceremony and the ritual. Most baptisms take place during the Saturday and Sunday mass. It is a short ritual, around 30 minutes in duration, and often a part of the mass itself, especially when more than one baptism is scheduled for the day. Alternatively, they can be scheduled after the mass, especially if the family doesn’t belong to the parish. Godparents are a child’s spiritual mentors and guardians. Technically, they ought to be selected for the strength of their Christian faith, people the Church is willing to help you choose. In practice, however, godparents are usually good friends of the parents. Some thought should be put into this. First of all, if the first choice for a godparent is someone of different religious beliefs, the match is impossible. My own godmother had to be baptised right before my own ceremony, in order for the vicar to accept her. Strong faith is the key to a godparent in the eyes of the Church, but in the eyes of the parent, it is reliability. A godparent has a formative role in the life of a child, whether or not the family practices their faith actively. It is crucial to choose a responsible, reliable friend who will be there for the child in 10 years, in 20 years, and who has qualities the parents would like for their child to pick up on. There is a custom where the godmother bestowes the baptism gown upon the child, as the godfather provides the cake. However, shopping for a baptism or a christening gown, as they are often called, is a fun and creative process, much like shopping for a wedding gown, and mothers, aunts, and grandmothers like to be involved. As the gown is designed to be an heirloom of the family, it only makes sense for the immediate family to be involved with tailoring all their future infant baptisms. especially if family came from afar to participate. Sandwiches and cake are a good choice for food after the ceremony, nothing too fancy, nothing hard to spell. Baptisms are a wonderful occasion for the family to get together outside the Christmas season. Finally, there is a lot of confusion between these two terms. They are often used synonymously, but most Christians are well aware of the difference, and use them accordingly. A baptism is a ritual where the spirit is cleansed. A christening is a naming ritual. They are normally performed together, but some families choose to have only a christening. 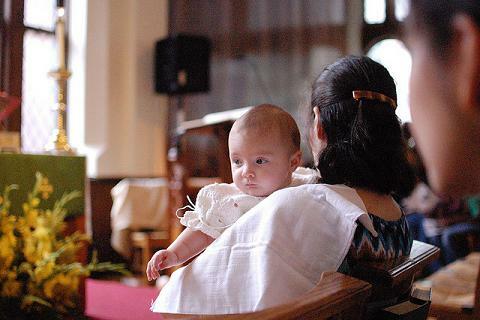 A child’s christening is obligatory, and a baptism can be performed on adults. Some denominations even insist on adult baptisms.